English language news articles from year 2007 plus find out everything about Asiatic Lion and Gir Forest. Latest News, Useful Articles, Links, Photos, Video Clips and Gujarati News of Gir Wildlife Sanctuary (Geer / Gir Forest - Home of Critically Endangered Species Asiatic Lion; Gir Lion; Panthera Leo Persica ; Indian Lion (Local Name 'SAVAJ' / 'SINH' / 'VANRAJ') located in South-Western Gujarat, State of INDIA), Big Cats, Wildlife, Conservation and Environment. The leopard was rescued after 90 minutes of hard work. RAJKOT: A one and a half-year-old male leopard was rescued by forest officials after over an hour of hard work from a farm in outskirt of Vavdi-Adri village, six kms from Verval town in Gir Somnath district on Friday. 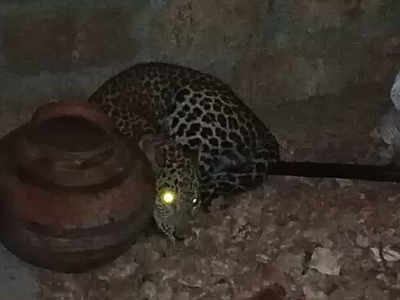 According to forest department, the leopard entered into farm of Bhagvanbhai Ramabhai Solanki on Friday early morning. It was spotted by farmer and his family members when they arrived there in the morning. 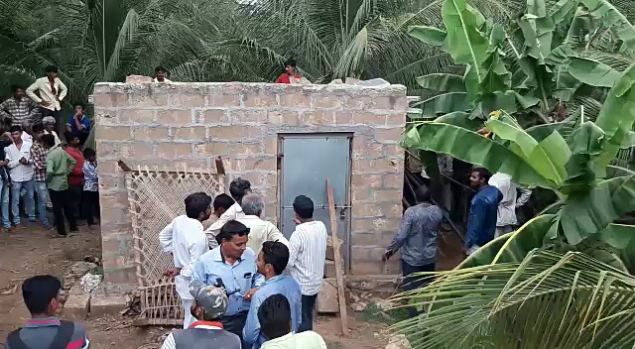 The leopard was seen hiding inside a small room, a place for keeping farm equipment. Villager had locked the leopard inside a room. Fearing an attack, locals locked the leopard inside the room. The farmers later informed forest department, who arrived there within 30 minutes. A beat guard said, “it was difficult to open the door because leopard was already very scared and possibly could have attacked." " INDIA, MY MOTHERLAND " The Four-Headed Lion - The Symbol of INDIAN Sovereignty. Asiatic Lion Protection Society (ALPS) founded in year 2006, is an NGO working mainly for conservation of Asiatic Lion in Gir forest and in Indian Zoos. Main objectives: To compile max. information about Asiatic Lion plus Gir forest and spread it through out the globe by website, blogs, Wikipedia, yahoo groups etc To help protection & conservation of Asiatic Lion & Gir forest by taking up projects like - Building parapets on open wells. - To contact and request nationalize banks of Gir area to put a condition to built parapet on open wells while sanctioning loan to farmers - At the time of festivals, organize camps near temples like Kankai, Banej & Tulsi Shyam to educate tourist to protect wildlife. - To distribute information and awareness leaflets at check-post to visitors using jungle roads. - Make representation & persuade Govt. to make Gir 'A Plastic Free Zone. Similarly contact local civil bodies to make their areas A Plastic free zone. To inform authorities about illegal activities inside the jungle like wood-cutting, removal of forest produce, poaching, illegal grazing etc. To inform authorities about injured wild animals. Also educate locals of Gir forests as well as school/college students to conserve Gir forest, it's wildlife and to represent to Govt. in favor of trans-location of Asiatic Lion to some other good place in Gujarat. P S: We welcome your comments & posts and expect that our conversation will follow the general rules of respectful civil discourse. You’re fully responsible for everything that you submit here in your comments & posts. If you wish to travel Gir forest... we will be happy to help, guide and accompany you to explore Gir forest for the best experience. Please contact us for the same. Gir lies has a topography made up of succession of rugged ridges, isolated hills, plateaus and valleys. Besides, being the last abode of Asiatic lions, Gir forms a unique habitat for ratel, rusty spotted cat, pangolin, ruddy mongoose, civets, paradise flycatcher etc.The overwhelming presence of the omnipotent big cat diverts the attention of the common man from the remarkable bird population that the sanctuary has. However, the birds of Gir sanctuary did attract the great ornithologist, Dr. Salim Ali who believed that, had the Asiatic lions not been there, the area would have been one of the most fascinating bird sanctuaries of the country. People mostly link Gir with "Maldharis" who have survived through the ages by having symbiotic relationship with the lion. They are religious pastoral communities living in Gir. Their settlements are called "nesses". At present, Gir forests of Gujarat (India) is the only natural place where this race of lions i.e. Asiatic lion is found. Gir at airport: Lions roar when provoked! The Asiatic lion’s range shrank steadily until the 19th century, when guns all but wiped out the population. Age(aprox. ): Male-14 & Female 11 Yrs. From Times of India, Hindu, Hindustan Times, Economic Times, Asia Africa Intelligence Wire by Google. Gir Lion Sanctuary to close for visitors from June 16th. Lion population registers healthy growth Gujarat districts news.